Private LowCountry Home, w/guest house, has fixed dock, floating dock and jet dock for your boat. THE PHOTOS SAY IT ALL! 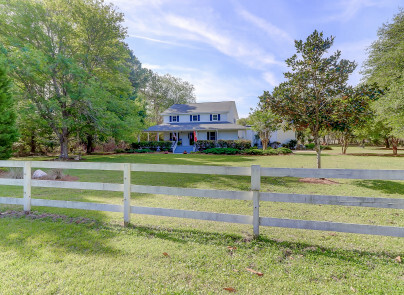 Professionally landscaped site on waters edge - 7.6 acres ~ bounded on the North by 5 ac. of pines and on the South by Marsh and Tidal Creek, w/ 6 - 8 feet at high tide. This lovely 4 bedroom 3.5 baths with master down (and up), large dining room/sunroom, updated kitchen, double sided fireplace between family/dining room, office and sitting area to enjoy the view, and a detached guest cottage completes this incredible package. A MUST SEE !